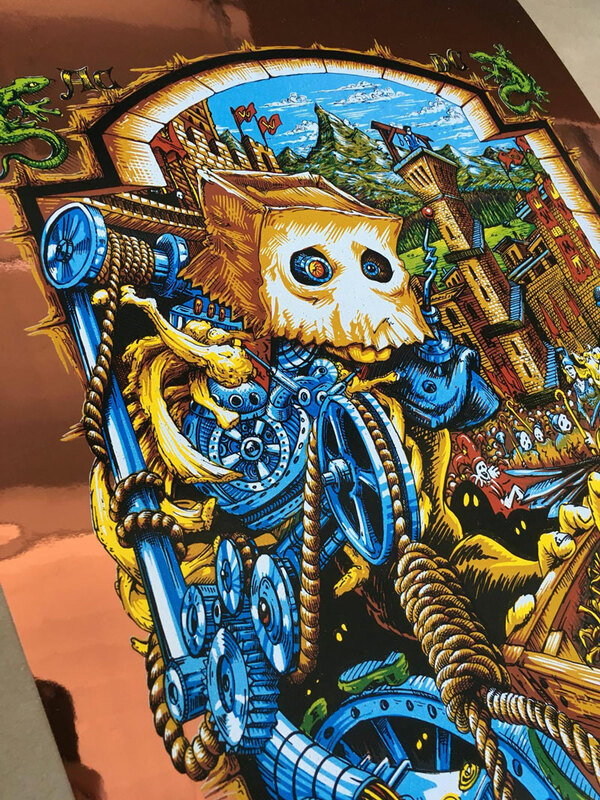 To celebrate the publication of The Phish Companion, 3rd Edition, master printmaker AJ Masthay has created a stunning new work to benefit The Mockingbird Foundation. The print, entitled "No Future at All," will go on sale via the Bottleneck Gallery website on Thursday, September 8 at noon ET (9am PT). 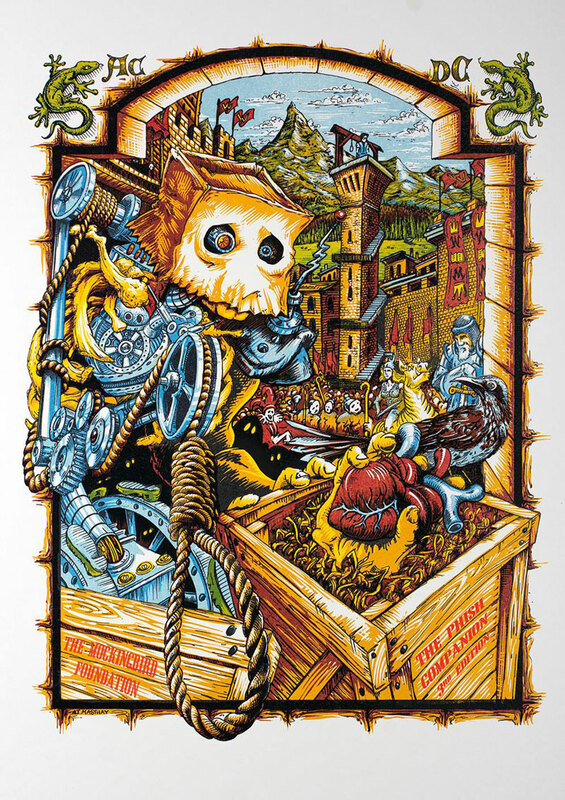 With this print, AJ returns to Gamehendge to illustrate everybody's favorite robotic executioner. Here the AC/DC Bag is more cyborg than just robot: he started out human, but was cruelly augmented with machinery. One arm has been removed, replaced by a hangman's noose. The skin has fallen from his trunk, revealing a clockwork of machinery inside. Yet a hint of humanity can be seen in his eyes as, with a look of sorrow and dismay, he peers into a crate containing a human hand and heart - lost pieces of his former self. We've really got to hand it to AJ...he put a lot of heart into this one! "No Future at All" is an 18" x 24" eleven-color linoleum-cut print, and will be available in three signed and numbered editions: a standard edition of 420 (on Crane Lettra Ecru paper), a sparkle variant edition of 100 (on sparkle foil paper), and a copper edition of 15 (on copper foil paper). 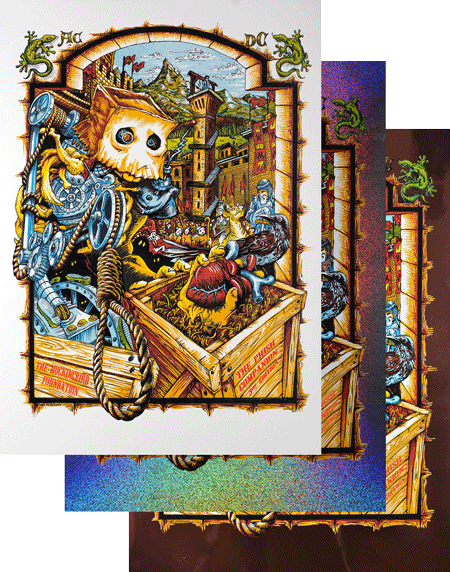 Purchases are limited to one of each edition per customer, and each print will include a copy of the all-new Phish Companion (shipped separately). Proceeds fund grants for youth music education. Tomorrow. Noon (ET). Bottleneck Gallery. Don't be late!